however, for those of you who are not as technologically savvy as me (i’m being 100% facetious here) i apologize for not clarifying exactly where the “subscribe to” button is located on the main page of colormykitchen.com. when you are on the main page, on the righthand side under the logo there is a FACEBOOK button and an RSS (feed) button. if you click on the FACEBOOK button you will be directed to my newly launched page. if you click on the RSS button, you will be directed to another page with a subscription option on the righthand side. you will be asked to enter the email address to which you’d like to receive my weekly blogpost “updates”. 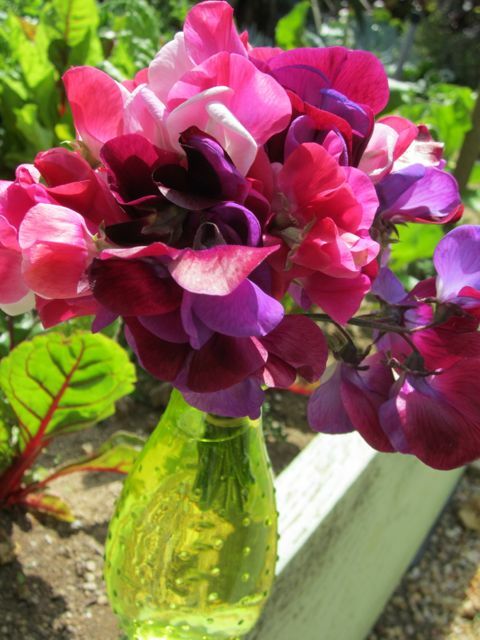 so… for those of you who ran into difficulties signing up, i am sending you a sweetpea bouquet as well! keep in touch for next week’s recipe/garden news: “all kale’s broken loose!” you guessed it, a kale recipe or two coming your way. warm thanks for your support in my new endeavor…and a special thank you to my dear friend sandra who gifted me with this beautiful and “colorful” vase for my flower and herb bouquets! This entry was posted in news from color my kitchen! and tagged bouquet, spring, sweet peas, thank you by jaime. Bookmark the permalink. yes, one of my absolute favorite vessels for showing off blooms! welcome to color my kitchen! i’m elena and i invite you to brighten your kitchen with color and food using the earth’s bounty, tasty and healthy recipes. stir in plentiful humor, entertaining friends and family, music, vibrant seasonal ingredients and simmer together into a passion for all that you create in your kitchen. news from color my kitchen!